360 degree assessments are quickly becoming one of the most popular tools used for human resources departments. This type of feedback is most often used for professional development, but can also be used to make managerial decisions. It is human nature to act differently to people in different rolls. With 360 degree assessments, you get feedback from everyone around you. It has several benefits over traditional, single source evaluations. Getting information from the people you manage, peers, boss, and partners will drastically improve accuracy. 360 degree feedback first began in World War II when the Germans were looking for an effective way to evaluate their officers. This proved to be extremely effective for improving leadership. In the 50s the Esso Research and Engineering Company came up with a complex formula for evaluating mid-level management. This was extremely time consuming, but proved to be a sound investment for the company. In the 90s most HR departments were very familiar with 360 degree feedback concepts. Because of the time and expense of running the reports, most companies didn’t conduct the analysis. Everything changed when the Internet made its way into nearly every company. This has made it extremely easy to streamline the 360 degree processes, and get the data from necessary employees. Now, nearly one third of all U.S. companies use some form of multi-source evaluation. Many people will argue human capitol is the most valuable asset for many companies. Investing in this asset means developing and improving the work force that runs the business. 360 degree feedback’s main purpose is to improve the way people interact with each other. This can improve product development, customer satisfaction, sales, and nearly all other aspects of a business. 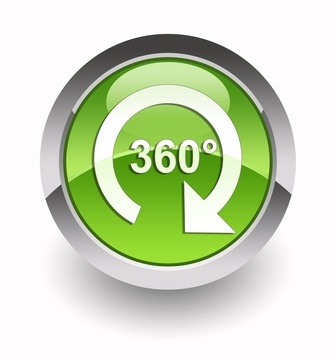 There is no question 360 degree assessments are here to stay.